I've had hit and miss luck with buying good quality activewear fabric online. 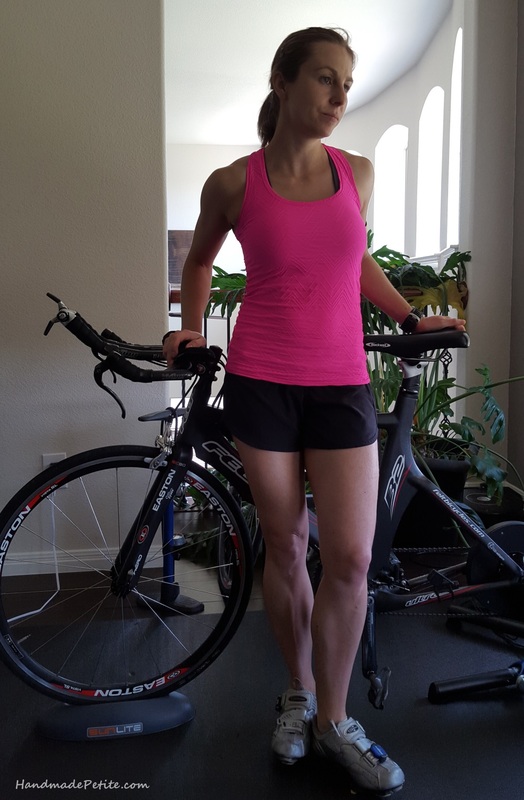 I'm very particular about workout clothes because on weekends I'm often biking, running or both for 2-3 hrs at a time, sometimes longer in the Texas heat. This means I'm drenched in sweat and if the clothes are chafing somewhere then it's real problem. Something that can feel perfectly comfortable on a 5 mile run can feel unbearable when running 15 miles. I've often spend more on cycling and running gear than on work clothes so my bar for tech apparel is set high and half the time when I've bought activewear fabric online I was thoroughly disappointed in the feel, breathability, stretch etc and chucked the fabric aside. On a couple of occasions though I've been thrilled with the purchase. This bright pink Nylon/Poly/Lycra from FabricMart was one of those fabrics. I've been sewing up a lot of stuff with fabric from FabricMart lately and I've been very happy with it. The prices are great too, but the one downside is that their stock changes all the time so I can't count on reordering something. I wasn't sure exactly what the fabric would be like based on the description, but as soon as I saw it in person, I knew I had to make a top because it's perfect for high visiblity when cycling. It is soft and stretchy with an interesting Jacquard geometric print. I traced an exiting running tank to get the fit right. All construction was done on the serger with the main spool being the stretchy Maxi-Lock thread. The finishing was done on the coverstitch. Everything was super quick and easy to make except the pocket. The pocket is key for cycling to be able to carry a cell phone or nutrition. I initially wanted to add a zipper, but realized that with a really stretchy fabric it won't work really well. Instead, I opted for just a regular pocket and made it just wide enough that my phone can fit when it's stretched. On this picture I put a large packet of energy blocks and they were holding in just fine as I was setting up and riding. I sewed the pocket on before sewing the front and back pieces together, but even then it ended up being trickier than I expected. I didn't want to show the top-stitching around the pocket because my thread didn't match 100% so I was sewing it on from the inside. The first half was super easy, but then the foot was basically stitching inside the pocket while I was stretching the fabric to see what I was doing. The last bit I just finished by hand. I need to find a better way to do this next time or just give up and top stitch the whole thing. 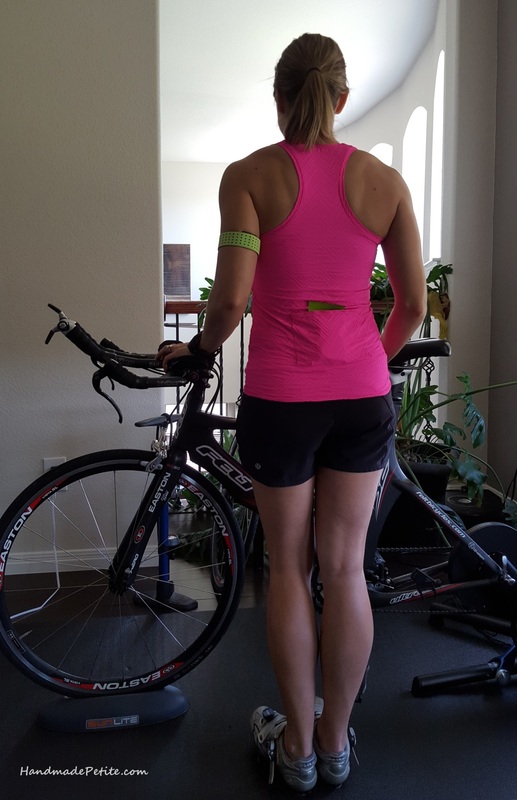 From the back picture, it looks like some fabric is gathering in the lower back, but it was done intentionally so that when I'm riding in the aero position on the bike the shirt can stretch out across my back and doesn't ride up. Here are some shots of the tank in action. 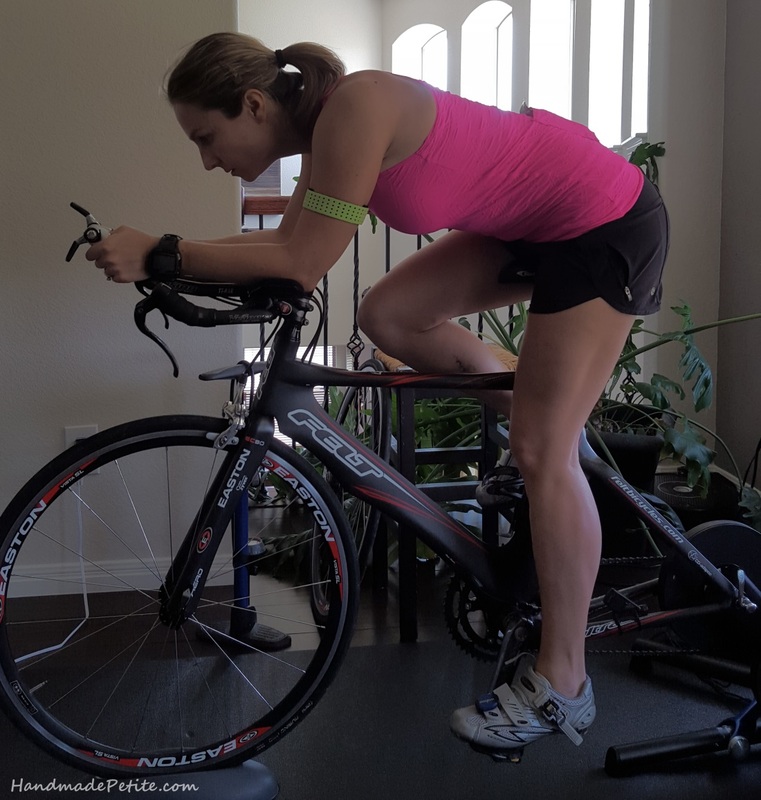 This spring has been exceptionally rainy in Austin so I've been forced to do a lot of my bike workouts indoors on the trainer. On Monday the sun finally came out for a few hours and I took advantage of it to get in a run workout. I was concerned how the seams would feel on the run, but so far so good. I think the Maxi Lock thread helped with that. Now that I've tackled sewing my first activewear garment and it passed the weekend workout test, I'm more eager to sew up a few more things. Thanks for reading.